Whether renting or paying off the mortgage, financially stretched Sydneysiders are being offered relief over Easter from Goulburn. 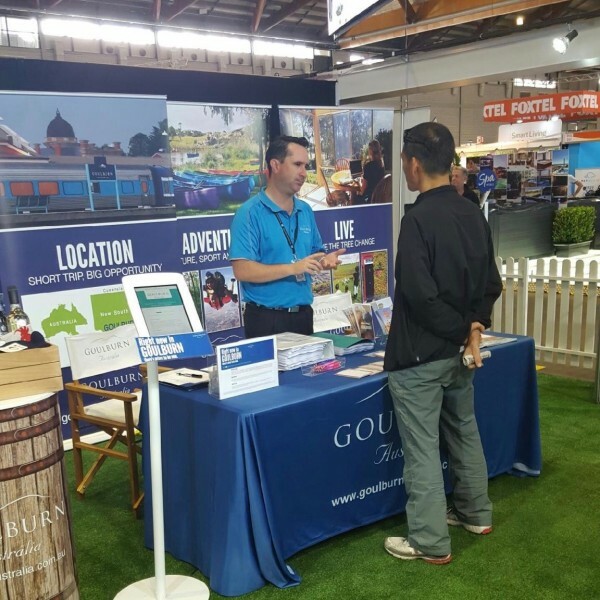 At the Royal Easter Show Goulburn is occupying a stand twice the size it has been taking since the 2012 launch of the Right Now In Goulburn campaign. Goulburn Mulwaree Council marketing officers Jessica Price and Paige Penning say as an attraction, housing affordability is second only to Goulburn’s location. People promoting Tamworth, Armidale, Dubbo, Orange, Wagga Wagga and other country centres are on the housing affordability bandwagon. At Orange a three-bedroom home in Summer Street is on the market for $299,000. In Goulburn, a three-bedroom California bungalow in Kinghorne Street was sold for a a similar amount. But Orange is almost four hours from Sydney. Goulburn is only two hours. The location and price edge are as sharp as ever in the latest figures which show Sydney house prices leapt 18.6 per cent over the last 12 months, and Canberra’s jumped by 12.8 per cent. Goulburn identified housing affordability as negatives for living in Sydney and Canberra in 2012. “The cost of living was becoming suffocating, these people had a common problem,’’ Ms Price said. “They want to live their lives but not be slaves to their mortgages, that’s even if they are in the mortgage game, a lot of them were renting and struggling to break into the market. Since 2012 Goulburn’s median house price has climbed from $291,685 to $372,937, at a slower rate than Sydney’s, making the affordability story even more compelling. “When we started telling people at the Sydney Royal Easter Show, about house prices they were just gobsmacked, they said why didn’t we know about this stuff?’’ says Ms Price. An annual marketing budget of $50,000 has grown to $200,000. Two additional staff have joined the promotions team to focus on events and media and, with the council’s backing, momentum continues to build. Ms Penning says: “The (Royal Easter) Sydney show is a significant investment, we have been happy every time. “A lot of people at the Sydney Show say, ‘Oh, I already have a weekender at Windellama or Taralga, I’m still working full-time in Sydney’,” Ms Penning says. “They are starting to spend more time down here, buying a little house to renovate.” Some weekenders eventually begin a little business, like a Christmas tree farm, or growing and exporting cherries. The marketing team uses social media and Instagram in particular to promote Goulburn, helped these days by community groups and individuals who are becoming ambassadors. Photo: Goulburn Mulwaree Council’s James Groves talking to a visitor at the Sydney Royal Easter Show stand on Friday morning, supplied. Goulburn’s housing prices are crazy high. There is room around Goulburn to build houses for millions of people. There is SO MUCH land available that there should be no premium on the land. It costs about $50,000 to service a flat block of land with roads, power, sewerage etc. You can build a 3 bedroom brick veneer house for $180,000; so why can’t I get a house and land package for $230,000? Older houses should be less. If you pay anything more you are just paying a speculative premium.